Patrick Doyle (Cinderella; The Emoji Movie; Jack Ryan: Shadow Recruit; Man to Man) gives us a score that's from the heart with All is True. It's a hauntingly beautiful one that once heard will stay with you. On repeat listens I was convinced I knew several of these themes from years ago... that's how under your skin Doyle manages to get. The album contains 17 tracks (36 min, 41 sec) and works just as well outside the movie as it does when accompanying the onscreen action. I've been a fan of Doyle's since I went to the cinema to see Carlito's Way (1993) - being impressed by the film, but even more impressed by the music. His score for Eragon is still one that I regularly dig out and play. 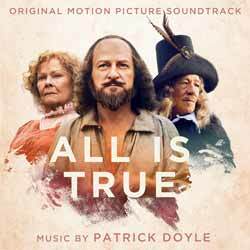 Talking about the soundtrack for All is True, Doyle said: "I have the great fortune of a long-standing working relationship with Kenneth Branagh, which has been a huge pleasure and very fruitful. Kenneth kindly asked me to score the picture, All Is True, and I readily agreed. I loved the script and, of course, with the knowledge that Ken and Judy would be playing William and Anne, I knew it would be electric and historic. The schedule was very tight and I was sent the rushes every day, composing hot on the heels of the cut. This included two songs written to Shakespeare's words, which both feature in the screenplay: 'Fear No More', from Cymbelne, and 'I Know A Bank' from A Midsummer Night's Dream. These songs formed the foundation for the thematic development of the score. It is always a privilege to have the opportunity to set music to William Shakespeare's words. He has been a constant inspiration to composers through the ages and I am no exception." Overall an enjoyable, laid back affair that will stick with you for a long time.